The festival of Ugadi is celebrated with a great favor in the state of Andhra Pradesh. The festival is known as Ugadi in Andhra Pradesh and Karnataka, whereas in Maharashtra it is called as Gudipadava. The creator of the Hindu dynasty the Lord Brahma started his creation on the day of Chaitra suddha padhyami or the Ugadi day. Additionally also the great Indian Mathematician Bhaskaracharya's calculations proclaimed that the Ugadi day from the sunrise on as the beginning of the new day. The festival is celebrated on the first day of the first month of the Telugu Year called the Chaitram. This day is celebrated as New Year Day by the people of Andhra Pradesh. This day is known for its 'Ugadi Pacchadi' preparation comprising of six tastes, each standing for a special character that a man experiences in life. The ingredients of this preparation, though of different tastes or characters when mixed in definite proportions result in a delicious dish. People celebrating this festival wake up early in the morning at about 5:00 am have their head bath, and wear new clothes. Elder woman of the house prepares Ugadi Pacchadi Prasadam and distributes it to all the members of the family chanting the following sloka.The Prasadam that is prepared during the festival is to be taken with an empty stomach as to have a balanced life all through the year. A delicious lunch comprising of Garelu, Pulihora, Payasam is also prepared. This day is also known for its "Panchang Sravanam" which is celebrated by the Veda Pandits. The Panchaang contains astronomical data relating to the position of the Sun, The Moon, Planets, Stars and details of Eclipses, Occultations, Raasi results, Muhurtams etc. for one complete year, mainly during the month from April to March. 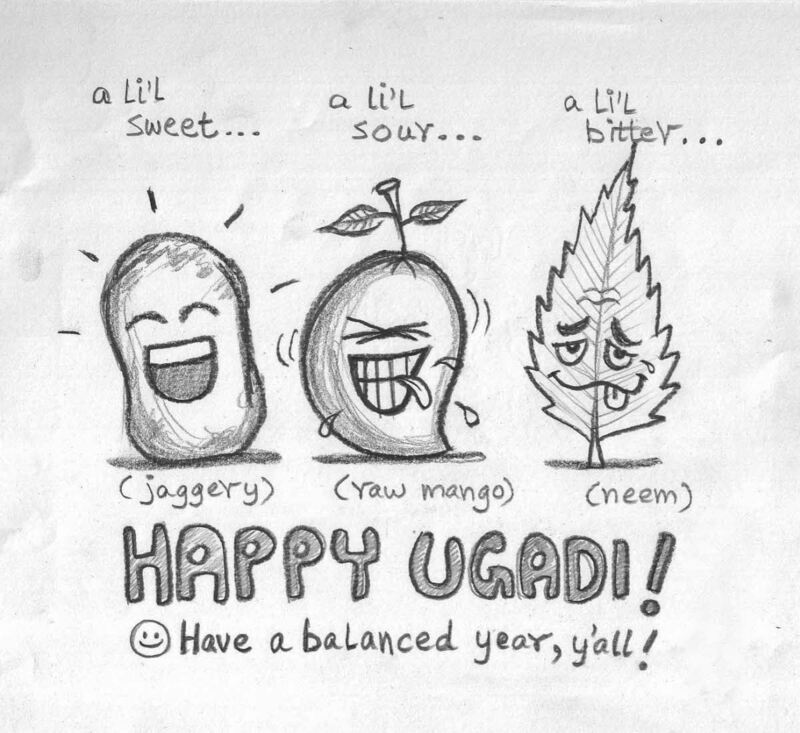 While, Ugadi is celebrated on 11th of April this year. During the festival people attend the temple in the evening where a Siddhanthi recites the Panchanga Sravanam. The yearly fore cast for the country as a whole, and the different places and people coming on Raasis will be known. It is believed that listening to Panchanga Sravanam gives goodness to the people. On the day of Ugadi, the people wake up before the break of dawn and take a head bath after which they decorate the entrance of their houses with fresh mango leaves. The significance of tying mango leaves relates to a legend. It is said that Kartik and Ganesha, the two sons of Lord Siva and Parvathi were very fond of mangoes. The festival of Ugadi is well celebrated by religious zeal and social merriment. During the festival special dishes are prepared for the occasion. In the state of Andhra Pradesh all the eatables such as "pulihora", "bobbatlu" and preparations made with raw mango are made. In Karnataka similar preparations are made but called "puliogure" and "holige". The Maharashtrians make "puran poli" or sweet rotis. The people visiting the place for the festival perform the ritualistic worship to God for his blessings before they start off with the New Year. They pray for their health, wealth and prosperity and growth in business too. The festival of Ugadi is also the well known time to start new ventures.